In 2013, we first had the idea to let researchers choose between three ‘levels’ of metadata. Our thought was that every researcher should choose, how much energy he or she wants to spend in creating metadata. Unfortunately, the concept was not easy sledding and it was difficult to implement on a technical level. Now, everything is much clearer. 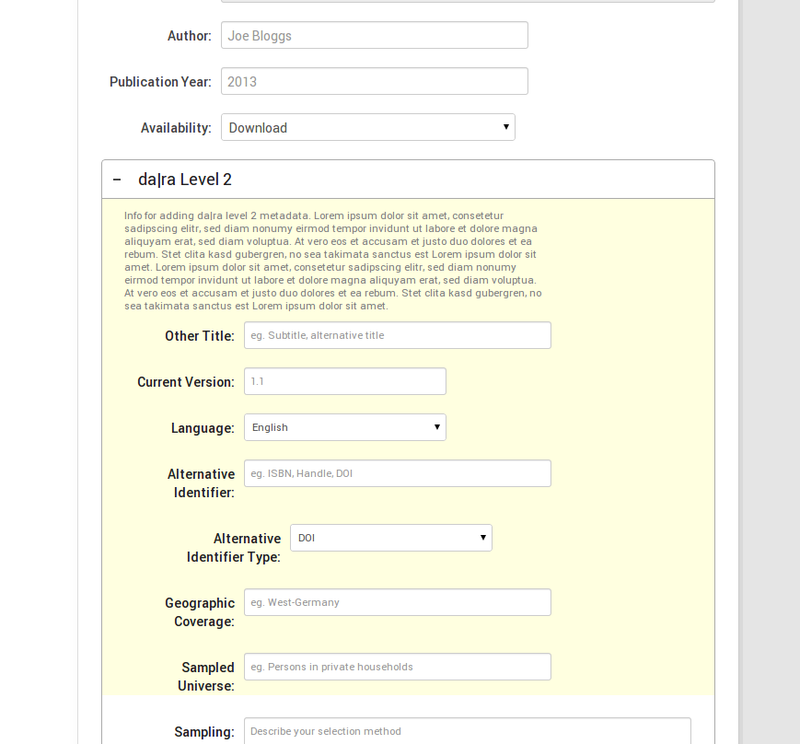 Authors of research article now can select the appropriate ‘resource’ (dataset, text, code of computation, or other). Depending on the file a research wants to submit to the data archive, the metadata fields and the application’s frontend vary. 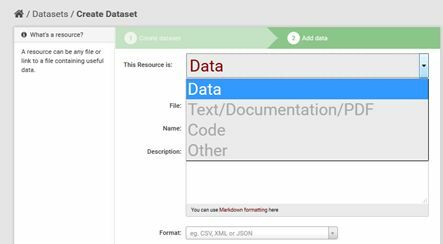 The reason is obvious: When you want to upload and to describe a syntax-file with metadata, you do not need the whole bunch of metadata fields that are useful for complex datasets. 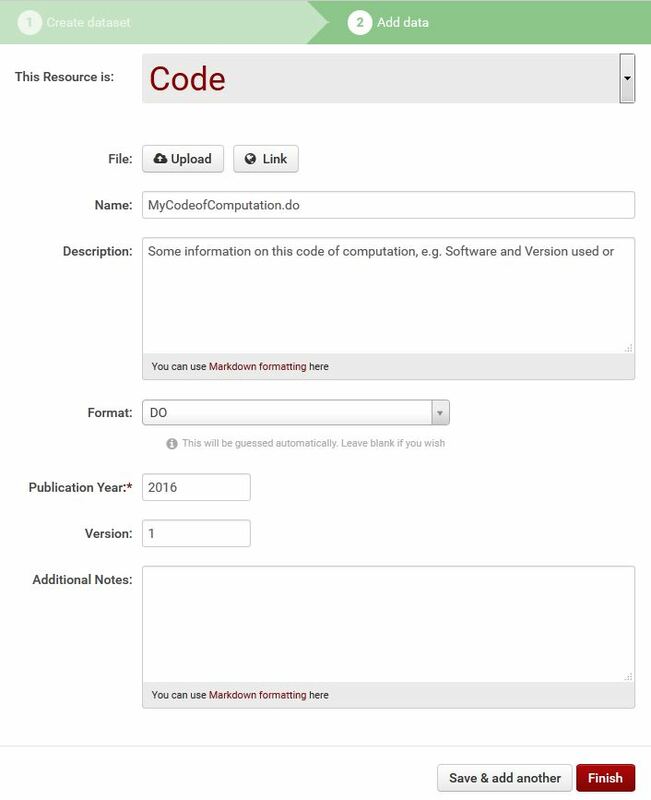 Therefore the metadata fields for resources like ‘text’ and ‘code’ are quite fast to complete. In addition, we massively reduced the mandatory and recommended metadata fields and tried to create as much metadata as possible by automated processes. We also included an author lookup-service to facilitate the metadata creation and the correct identification of researchers. An example on how this service works is available on the website of the ZBW. In the first quarter of 2016 we will publish a more detailed blog piece on all the recent changes in the application – maybe this is also of interest for the ever growing CKAN-community. – the year started with a talk on journal (data) management at a workshop commissioned by the Leibniz Association. It was very interesting to hear about the experiences about the current challenges of journals in different scientific fields. – in February we started an exchange of experiences on journals’ data policies with one of the major publishing houses, where we presented some of the project’s results. This was the beginning of a few meetings with the company. For us, it was a fruitful meeting and we learned a lot on how publishing houses deal with recent challenges (like implementing data policies for journals). – in March, we took part in a workshop on scholarly communication in economics, where we met people from interesting initiatives like the replication network and the replication wiki. – in April, the first project meeting of the year took place in Hamburg and we discussed a lot about the project’s future and the remaining tasks to complete until May 2016 (the official end of our funding term). – in May, I gave a talk a the German librarian’s day. The topic has been more on training and skills in research data management than on EDaWaX, but many of the facts I presented were derived from previous activities in the context of EDaWaX. – in June, I held a lecture on project management and our project at the Hamburg University of Applied Sciences – to me also a new kind of experience. In addition, we had a video conference with the editors of a renowned economic journal. The editors were interested in our pilot application and we -of course- we really happy to get in touch with them. Also in June, I gave a talk about our activities in RDM at this year’s LIBER conference. Another very fruitful workshop! – in September, I joined the ELPUB Conference in Malta, where I presented our most rescent paper based on the results of work package 2 of our project. – in October, we presented the project at the international partner meeting of the EconBiz-partner-network. EconBiz is ZBW’s disciplinary portal. – in November, this year’s second project meeting took place and we intensified our discissions with editorial offices. Now it is time to relax for a few days. 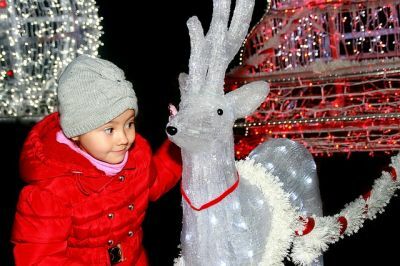 Therefore I wish you and your families a merry Christmas and a happy new year!